don't have them nor can they get them? Try online at autopartswarehouse or CARid. I'm having a hard time finding the front disc brake rotors for my thunderbird, I've gone to several stores but they don't have them nor can they get them? The new rotors for my 2005 ford ranger are too wide (1/16")....do i need to change calipers or turn new rotors? Are all 4 brake rotors interchangeable on the 2003 ford expedition? 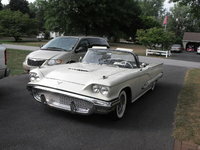 CarGurus has 10 nationwide Thunderbird listings starting at $13,595.